COFFEE BREWING MIXING DESK - Marco Beverage Systems Ltd. There is a real disconnect between the objectivity of brewing parameters, which can can be controlled and the resultant subjectivity of taste which can at best have frames of reference using cupping forms and cupping vocabulary. I’m not a ‘greenie’ and don’t purport to know anything of significance about origin and processing of coffee. I know enough to know I am consciously incompetent about the effects of origin and processing on the final cup.After the origin/processing bits are over, I’m a bit more prepared to involve myself in discussion, albeit warily. I have been rattling around in my head a simple way to chart and explain the effects each of the factors in the process of brewing coffee has on the final cup. I ended up with what I call the ‘Coffee Brewing Mixing Desk’. The name is obvious – music is the output of scientific inputs but the end product is the result of subjectivity. Those scientific inputs can be varied and tweaked to yield a different aural product. Thus with coffee. Scientific inputs deliver a cup which is subjectively decided upon for its value. Using the Coffee Brewing Mixing Desk, I can measure and chart all the variables and get what is the ‘perfect ‘ cup for the deciding palate, be it my own or anothers. If a brew is deemed optimum, we can then choose one of the parameters individually, modify it and establish its unique effect on the cup. The subjectivity of taste can at least then be charted for a particular coffee, allowing that cup to be replicated. You will see scales for grind distribution and turbulance are missing. Help on those would be welcome. You will also notice I have bean density included. What else would the greenies have – altitude? Process? Let me know. 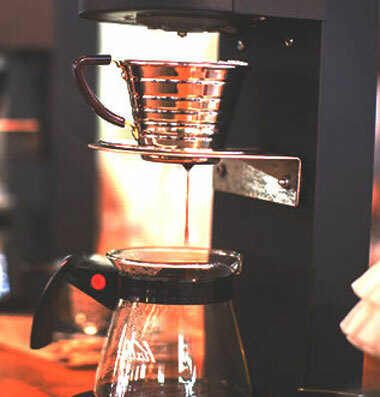 Correlating it to a Cupper’s Form, the Mixing Desk can be extended to include the cupper’s chosen parameters, be it acidity, balance, finish, body, whatever. Go a step further and you could take a cupping form, say CoE, and use its scoring system to give a numerical value to ‘taste’, change a brewing parameter and see what that change does to the taste in the cup. The reason I call it a mixing desk is because all the scientific parameters play off each other to deliver the cup. For example, a fine grind needs less contact time….or… hard water needs hotter water….or……a fine grind needs soft or maybe colder water. you get the picture. The final piece is to choose and chart your coffee. Measure it scientifically. Measure it using recognised frames of reference, say CoE. Now you have that all important reference cup, on paper. Obviously, the charted brew above is makey uppey. I will upload the forms so they can be downloaded to be easier to view. What have I missed? Am I delusional? Thoughts are very welcome.